This cake is the essence of springtime. Here in LA strawberry season starts in April and the sweet smell permeates the produce section of every market through summer. At just a dollar a pint it’s impossible not to load up every time I go shopping. Even more tempting are the vendors along the Pacific Coast Highway who sell flats fresh from the farm. I don’t think there’s anything that smells better than our car during a drive along the coast this time of year with pounds of ripe strawberries in the back seat. While there’s no shortage of things to do with strawberries – toss them in a salad, blend them in a smoothie, turn them into a spicy salsa for fish, sprinkle them over ice cream, the list is endless – this cake may be the thing that best celebrates their essential strawberriness. It was about 15 years ago that I attempted my first homemade zuccotto using this Martha Stewart recipe. While the ganache and crème Anglais were inspiring, the whipped cream filling was rather bland and the actual construction of the cake a disaster. Still, I love the idea of a fluffy cake surrounding creamy filling and smothered in sweet, chocolaty ganache. Cut to a decade and a half later and I couldn’t be more proud of this cake – especially the fact that, thanks to the use of a dome cake pan, it’s so simple that I made it twice in one weekend after guests helped us devour the first one. 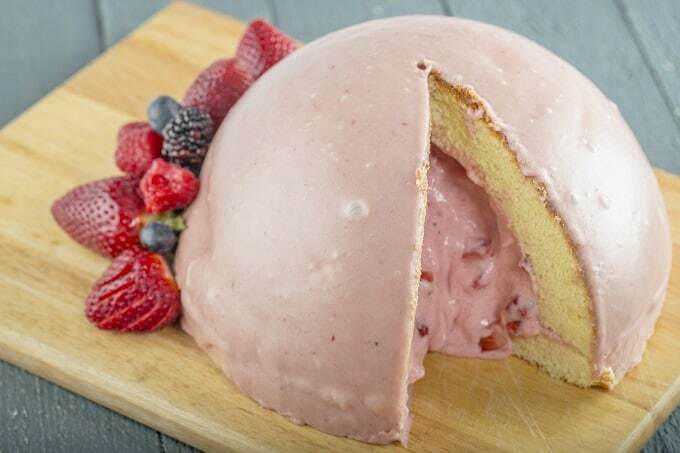 Here, traditional Italian Pan di Spagna is filled with a light, airy, intensely strawberry mousse and coated with strawberry ganache. This is accompanied, of course, with vanilla crème Anglais which, let’s be honest, is heaven on it’s own with berries. Sweet, fruity, and cheerfully pink it’s the perfect treat for your spring celebrations. Fresh berries are less significantly less expensive than frozen in LA this time of year but this recipe works with either to ensure you can capture the taste of spring any time of year and in any location. Combine strawberries with sugar and salt. Transfer to a large, fine-mesh strainer set over a large bowl. Let sit, stirring occasionally, 30 minutes while juices collect. You should have about 2-1/2 c strawberry juice. Transfer to a small saucepan and cook over high heat until reduce to about 1 cup, approximately 5-8 minutes. Watch carefully to ensure syrup doesn't burn. Transfer drained strawberries to a food processor or blender and puree until smooth. Return strawberry puree to the strainer and stir until strained. Discard remaining seeds and pulp. You should have about 2 cups puree. Stir reduced strawberry syrup into puree. Chop 1 cup fresh strawberries into 1/4 inch dice and set aside. Sprinkle gelatin over 1/4 c cooled strawberry reduction and let sit 5 minutes. Heat 1 cup strawberry reduction in a small saucepan over medium heat. Add gelatin mixture and cook, stirring, until gelatin dissolves. Whip 1/2 c heavy whipping cream on medium until soft peaks form. Add sugar and continue whipping until stiff peaks form. Gently fold strawberry mixture into whipped cream and stir in reserved diced strawberries. Refrigerate 4 to 6 hours. Butter the inside of a dome cake pan. In a small bowl, sift together the flour and cornstarch. In an electric mixer, beat egg yolks, vanilla, and 3/4 cup sugar until thick and pale, about 3 minutes. Transfer egg-yolk mixture to a large bowl. Wash and dry the mixer bowl. Combine egg whites and salt in the mixer bowl, and beat on medium speed until soft peaks form, about 1-2 minutes. While mixing, slowly add the remaining 6 tablespoons sugar. Continue beating until stiff and glossy, about 1 more minute. Fold the egg whites into the egg yolks. A quarter at a time, fold the flour mixture into the eggs. Fill the bottom of the cake pan with 1/3 the batter and smooth the top with a spatula. Fill the dome portion of the cake pan with the remaining batter and attach the cover. Bake until cake is just golden and a toothpick inserted in the center comes out clean, about 15-20 minutes. Turn the cakes out onto wire racks to cool. Finely chop white chocolate and place in a medium bowl. Bring strawberry reduction to a simmer in a small saucepan over medium heat. Pour over white chocolate and whisk until combined. 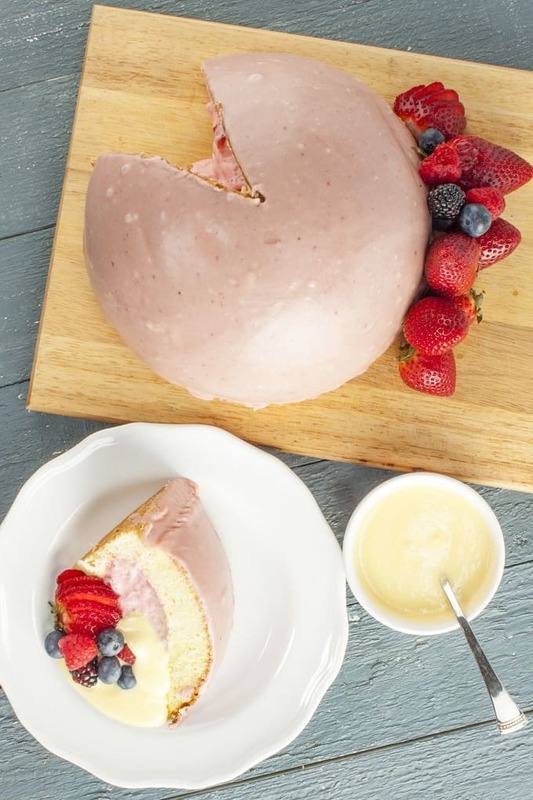 Fill cake dome with strawberry mousse and top with cake round. Place cake on a cooling rack set over a baking sheet. Pour ganache over the top of the cake ensuring it drips down for even coverage. Refrigerate assembled cake for at least 1 hour before serving. Whisk together egg yolks and sugar in a medium bowl. Combine heavy cream, milk, and vanilla in a small skillet and bring to a simmer over medium heat. Add 1/2 c warm milk mixture to egg yolks and stir until combined. Pour egg yolk mixture into saucepan and cook, stirring constantly, until thick. 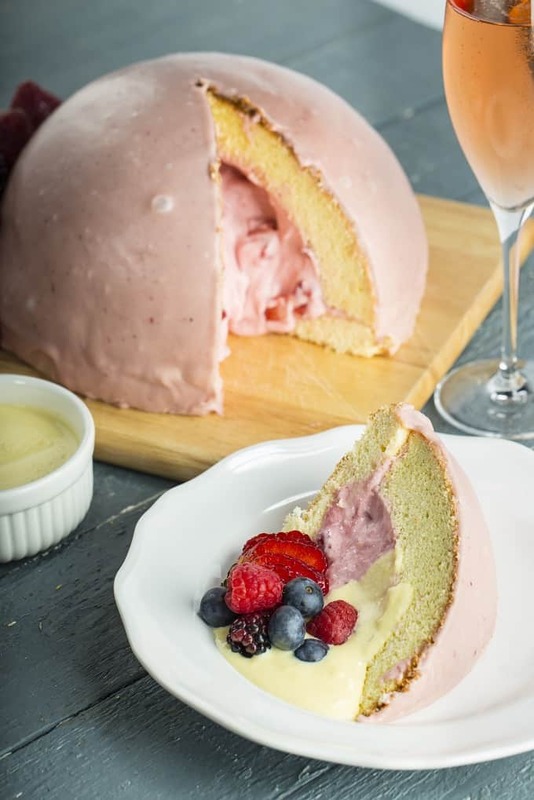 Serve cake with Creme Anglais and fresh berries, if desired. Wow, what a fancy cake! 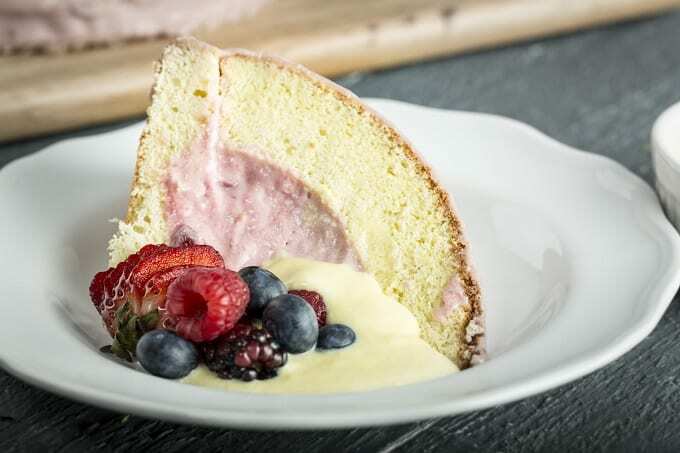 It looks wonderfully light and fluffy – a perfect match for those lovely berries! I wish I’d known about the markets you’ve been visiting when I lived in LA…I was getting ripped off!